Is Dreamline still manufacturing these doors. Thank you for reaching out to DreamLine. Unfortunately, the Butterfly Tub Door has been discontinued. We do make the Visions Tub Door, model #SHDR-1160586-01, that also opens from the center, similar to French doors. You can place that model number in the search field above and The Visions will come up for you. The DreamLine Visions would be a beautiful addition to your bath. If you have any other questions, please contact the DreamLine Customer Support Team at 866.731.2244. We are available 8am-7pm EST, Monday through Friday, and Saturdays from 9am to 5pm EST and will be happy to answer any questions you may have. You may also send an email to support@dreamline.com or use our LiveChat feature on DreamLine.com. Thank you for considering DreamLine! Does this 4 panel bi-fold come in brushed nickel? Thank you for reaching out to DreamLine. The Butterfly Tub Door is only available in Chrome. 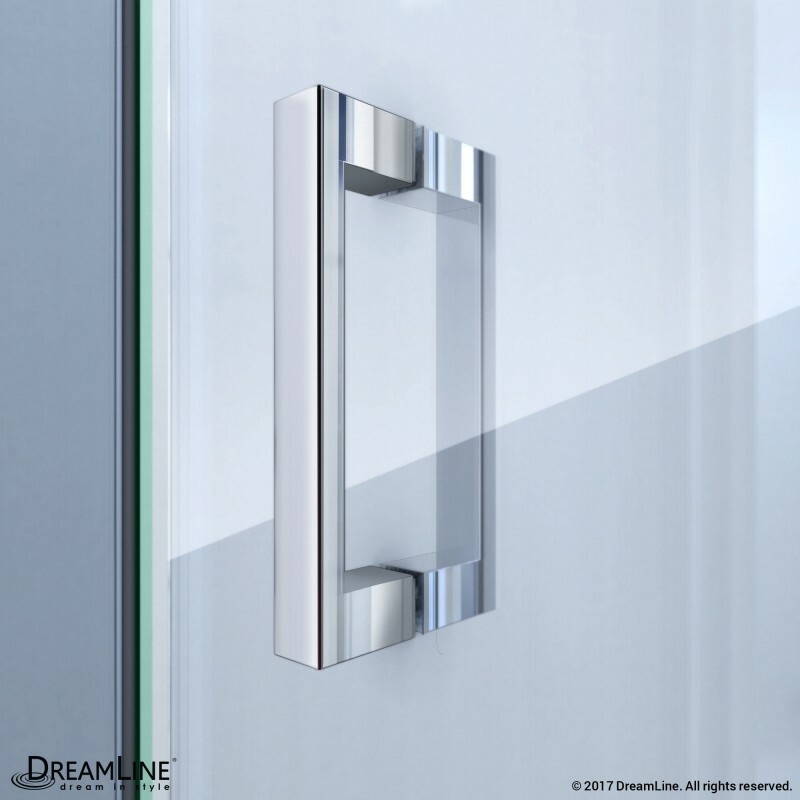 DreamLine does offer other tub doors that are available in brushed nickel, but not with the folding style like the Butterfly. The Visions may be of interest to you, however. The Visions tub door slides open from the center behind 2 small stationary panels. The model number for the Visions is SHDR-1160586-04. You can place that model number in the search field and it will come up for you. If you have any other questions, please contact the DreamLine Customer Support Team at 866.731.2244. We are available 8am-7pm EST, Monday through Friday, and Saturdays from 9am to 5pm EST and will be happy to answer any questions you may have. You may also send an email to support@dreamline.com or use our LiveChat feature on DreamLine.com. Thank you for considering DreamLine! 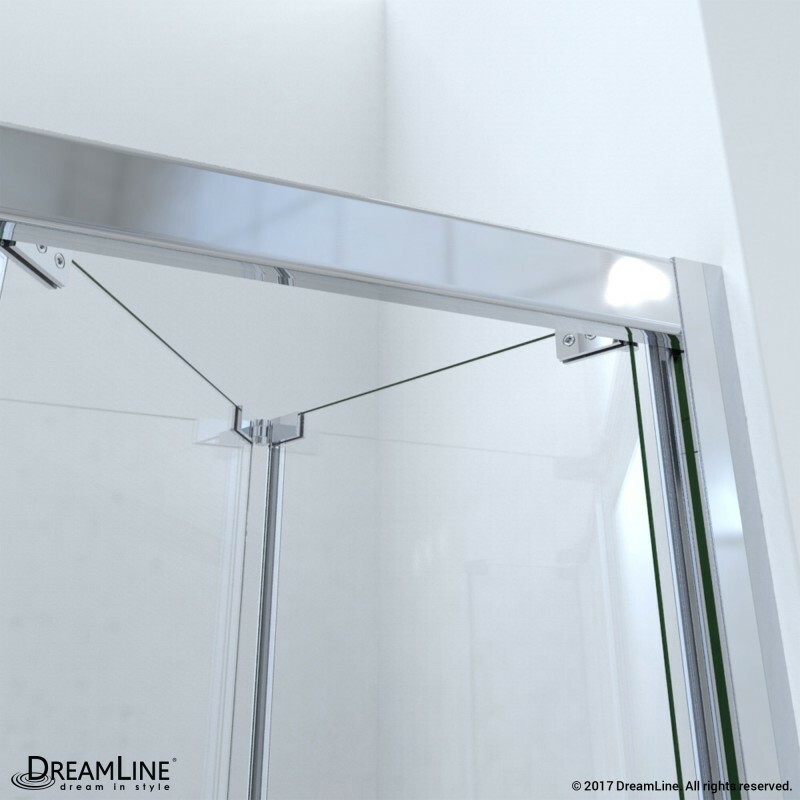 Do you have dimensions for your butterfly door to show how far the doors extend into the shower when in the open position? In your spec book it is noted as 'U' and 'Q'. Thank you. Thank you for reaching out to DreamLine. The larger side extends into the shower appx. 17&quot; while the smaller two panels extent into the shower appx. 13&quot;. Hope this is helpful. If you have any other questions, please contact the DreamLine Customer Support Team at 866.731.2244. We are available 8am-7pm EST, Monday through Friday, and Saturdays from 9am to 5pm EST and will be happy to answer any questions you may have. You may also send an email to support@dreamline.com or use our LiveChat feature on DreamLine.com. Can you get this in oil rubber bronze? Thank you for reaching out to DreamLine. Unfortunately, the Butterfly Tub Door is not available in Oil Rubbed Bronze at this time. 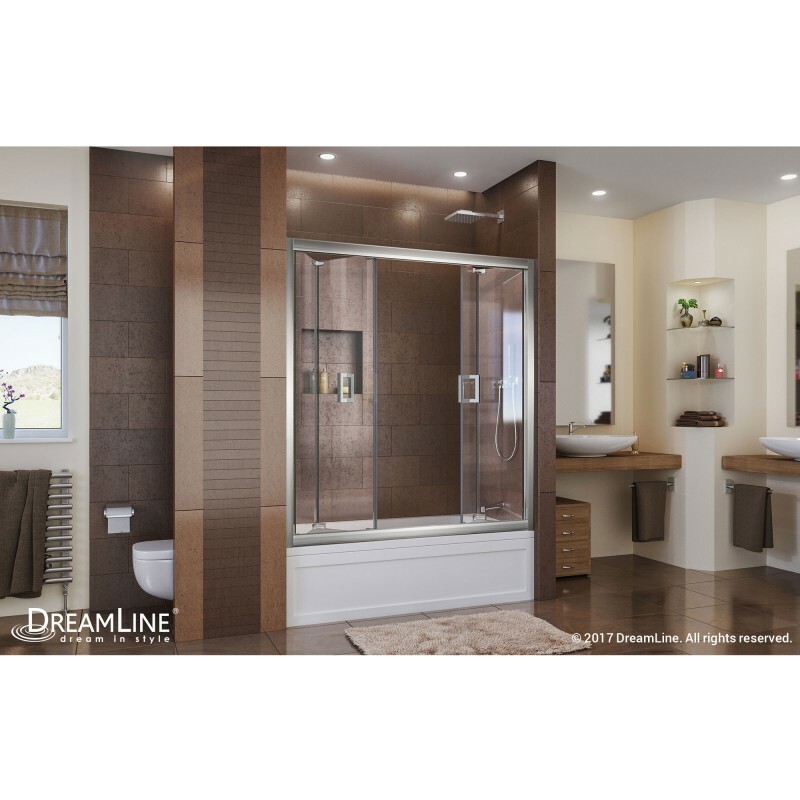 The only Tub door that DreamLine has in that finish is the Encore Tub Door and the model number for that door is SHDR-1660580-06. You can place that model number in the DreamLine search field and it will come up for you. It is a bypass shower door and one of our newest designs! Here is the link to the door, also: http://dreamline.com/bathtub-doors/dreamline-encore-56-60-in-w-x-58-in-h-bypass-sliding-tub-door_shdr-1660580-06.html If you have any other questions, please contact the DreamLine Customer Support Team at 866.731.2244. We are available 8am-7pm EST, Monday through Friday, and Saturdays from 9am to 5pm EST and will be happy to answer any questions you may have. You may also send an email to support@dreamline.com. Thank you for considering DreamLine! Do you make a frameless 4 panel bi-fold door suitable for walk in showers? Great question! Unfortunately, we do not have a 4-panel bifold door at this time. We do have the Visions Shower Door that could work for you, however. The model number for the Visions is SHDR-1160726-01. You may also want to consider the AquaFold shower door. It is not meant to span your entire opening, but it fold inward for access to the shower. The model number for the AquaFold is SHDR-3630720-01. 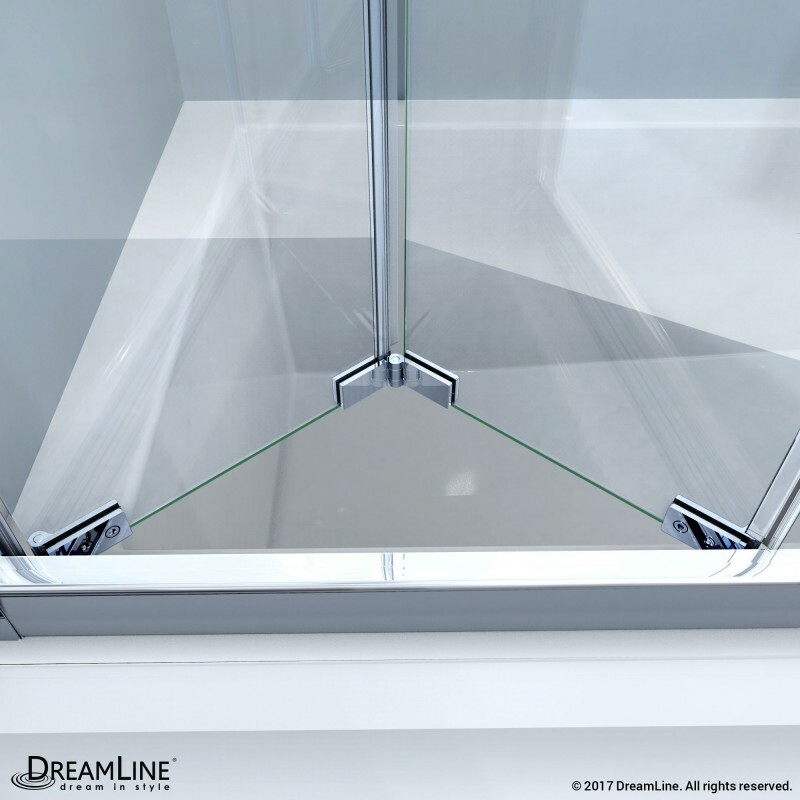 Without knowing you finished dimensions of your shower opening, it is difficult to say which DreamLine product will work for you. If you have any other questions, please contact the DreamLine Customer Support Team at 866.731.2244. We are available 8am-7pm EST, Monday through Friday, and Saturdays from 9am to 5pm EST and will be happy to answer any questions you may have. You may also send an email to support@dreamline.com. Thank you for considering DreamLine!